The Assault by Brian Falkner. A Recon Team Angel Book. Review: What the heck is going on? "We're sending them a message." The Assault, written by Brian Falkner, is three intriguing books in one. The main characters are Lieutenant Chisnall, known as LT, Sergeant Brogan of the human race, and Lieutenant Yozi of the Bzadians. To begin, Earth is invaded by aliens or as they call themselves, Bzadians. Civilians are forced to take refuge in the Americas, and Angel Team Four, a group of highly trained young recon units are sent to Australia or New Bzadi. They have a traitor on their team, but only the traitor and LT know that they have to infiltrate the main base of Uluru disguised as Bzadians, or as they like to call them "pukes". They make a very big enemy named Yozi who they tie to a tree because they thought it was unruly to kill an unarmed defenseless soldier. Was tying Yozi to the tree a good idea or the biggest mistake on the mission? I would give The Assault four out of five stars. I enjoyed the author's writing style immensely. I was impressed by the amount of action and suspense, like at the end of the 1st book and beginning of the 2nd book, there was a raid starting but you didn't know whom the raid was from. Also, there were plenty of cliffhangers and many violent scenes. For example, in chapter 13 a bomb turns off the lights. In addition, I liked the descriptive words because it helped me picture and imagine the scene. This book would attract advanced 6th graders or 7th graders. Any older age would possibly think that the book is boring. 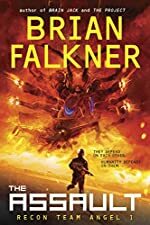 I found Brian Falkner's writing style entertaining as he used war terms in the future and created futuristic weapons and machines. Overall, I thought that The Assault was a fascinating book. We would like to thank Random House for providing a copy of The Assault for this review. Have you read The Assault? How would you rate it?